Cars are many things to people. 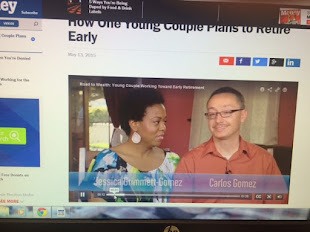 To the collector, they represent a form of art with both sentimental and monetary value. To the enthusiast, they represent a piece of the future in the flesh to be enjoyed at all times. To the typical consumer, a way to get to point B from point A with comfort, a bit of style, speed, and/or reliability. To the business owner, a car is a depreciating asset with a life of about 5 to 6 years. If only the layman who depends on a car were more like a business person who understands their true costs. New car: Between 9-11% on average, depending on the model. After the first year of ownership you can expect to have lost an additional 9% to 11% in value. The average rate of depreciation on a new car after 1 year is 20%. Used car: No data available, but undoubtedly less than what it is for a new car, especially if the car is between 2-5 years old. Say you buy a new car (an SUV, e.g.) that costs you around $31K. And I'd love to give you some concrete figures for used cars, but the dynamics of depreciation on a used car is much more complicated. A new car after a year will have lost 20% or $6,400 conservatively speaking, after a year. That's $6400 you're never getting back! Meaning, if you keep the car until it dies, so to speak, you've accumulated $38,400 in costs in year one of ownership, and this doesn't include other expenses like gas, oil changes, yearly registration, etc. 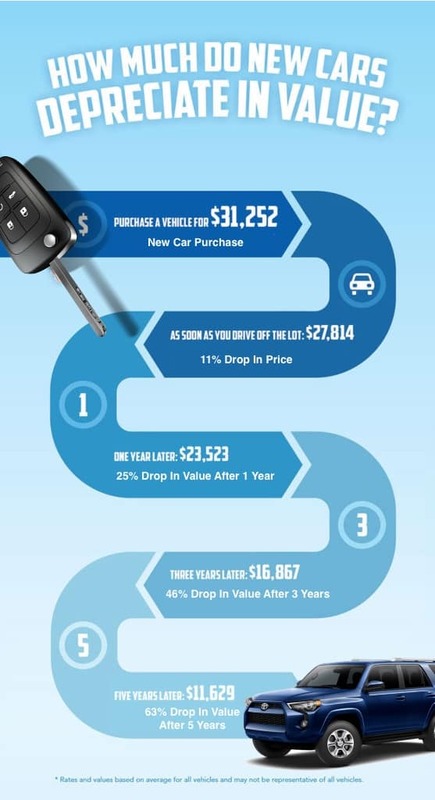 In the infographic above, the estimated value of the sport utility vehicle after five years of ownership is $11,629. That 63% decrease in value, representing $19,623 in additional costs to you. You may not think of it like this, but that's money you've spent, whether you're conscious of it or not. Again, this is not taking other car ownership costs into consideration (repairs, oil changes, gas, new tires, insurance, etc.). 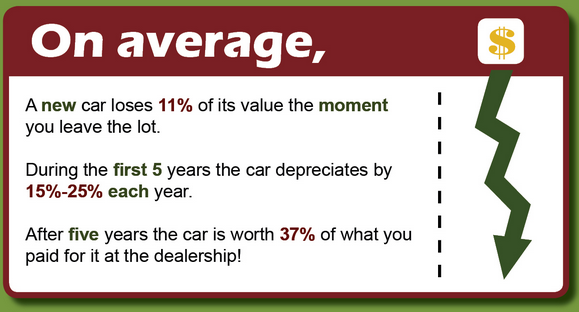 Depreciation is the single largest cost in owning a car. Fuel purchase, unless you own a hybrid or electric vehicle, comes in at a close second. Clearly then, many of us are not taking depreciation seriously enough within the total cost of car ownership. The most overlooked cost of ownership is depreciation!!! Buying a used car that maintains its value is of great importance. But so is buying a car you actually like and want to drive around in. A combination of low-depreciation rate and personal taste is clearly the best way to buy a used car. Notice, I'm beyond recommending you buy a new car because that's total shitville. There are other things to consider when buying a used car, of course. Like mileage. Finding a used car (1-2 years old) with the lowest possible mileage AND that is also a model consistently ranked as one with the least amount of depreciation over a 5 year period, is the equivalent of hitting a homerun to win the final game of the World Series. How To Buy A Used Car Knowing What You Know Now? Here are the steps to take when buying a used car. Remember now, depreciation is a true cost and it happens to be the highest among all. 1. Google: "Cars that depreciate the most," and make sure the model you want to buy is not on the list. An alternative search query can be, "Cars with the highest resale value." 2. Shop around for certified pre-owned cars (fulfilling criteria number 1 above) with the lowest mileage, not putting so much emphasis on the color of the vehicle if you can help it. 3. Make sure the price is fair by doing price comparisons. You will pay more for a used car with lower mileage, obviously. With the information I've presented here, you'll be a savvy car buyer in no time. Including car depreciation with all other costs and expenses of car ownership will help you make the best possible decision. Thanks for reading! Until next time.